The shopping in Paris provides excellent shopping opportunities. For many people Paris is synonymous with fashion and the fashion in Paris is considered to be the most elegant throughout the world. More than no other place in the world the female inhabitants keep up with the latest fashion trends. When a new season begins everyone seems to have the right clothes. When you want to find the right clothes to the right price, it is important to know where to find them. When it’s a matter of top fashion, there are many exclusive shops and boutiques located along Avenue Montaigne. The biggest concentration of women clothes is situated at or around Rue du Fau-bourg-St-Honoré and the more elegant Avenue Montaigne. Here are streets where you can meet the richest and most famous people. 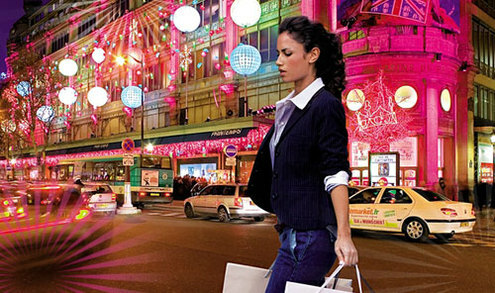 Shops like Christian Dior, Chanel, Pierre Cardin and Christian Lacroix is located here. The Italian elegance is popular in France and shops like MaxMaras and the fashion building of Giorgio Armani is wide popular. The Prada boutique is also a very popular destination.